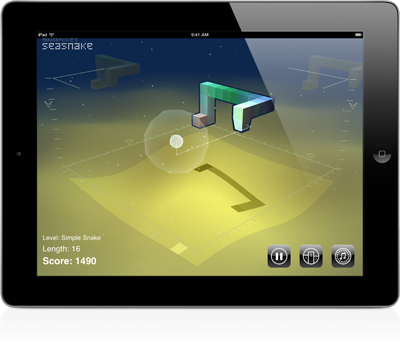 Mousepickle’s newest iOS application is a 3D take on the classic ‘snake’ game, allowing you to pilot your Sea Snake around his undersea realm with simple gesture control. You know the drill: eat the bubbles, get longer, avoid biting your own tail! You can read more about Sea Snake, and see brief instructions on how to use it (although the gameplay is so simple that you’re unlikely to need them). Thanks as always to the tireless efforts of friendly testers, reviewers, and suggesters-of-features. In particular to Becky for coming up with the term ‘Basket of Snakes’!